Po’ouli, Melamprosops phaeosoma This bird is found primarily in the upper forest of Haleakala. It is an endangered species. 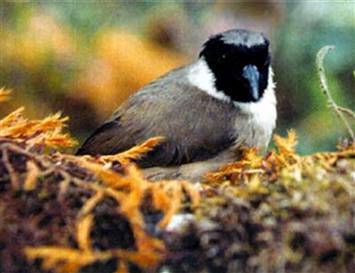 About five inches, dark gray with brown above, it has a black mask extends across the forehead and around the eyes, its underparts are buff washed with brown. Short tail and the feet and legs are dark brown. They feed on small snails insects.